On a recent Saturday afternoon, in a cozy Howard Street studio bedecked with twinkle lights and fresh flowers, six Burlington locals gathered with artist and educator Emily Anderson. Some made themselves tea before taking their seats at the big table, in the middle of which was splayed an oversize deck of cards. Anderson invited her guests to pick a card — their "Fairy of the Day." The Burlington artist's Demon and Fairy Drawing workshop is not an assembly of mystics, a traditional art class or a self-help seminar, but it has aspects of all three. 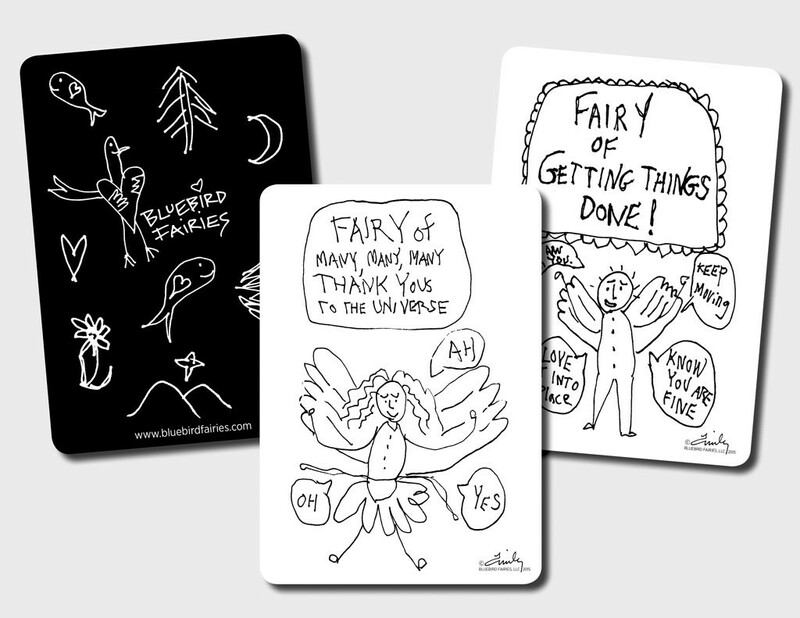 It's one of the services that Anderson, an "artist-inspirationalist," offers under the auspices of her business Bluebird Fairies. Another is designing and selling the cards from which the workshop participants were now choosing. Edward Burke, the January-February maker-in-residence at Burlington's Generator makerspace, pulled the "Fairy of Confirmation." Lucy Basa got the "Fairy of Chirping, Happy Birds." Printmaker Jabari Jones, whose studio shares a building with Anderson's, picked the "Fairy of It's All Going to Happen." They took turns introducing themselves and speculating on how their cards might fit into their current lives. Anderson has offered her themed monthly classes, at $10 to $15 per person, since October of 2016. At these two-hour sessions, she guides participants in sketching images of their personal demons, demon "antidotes" and fairies — with their non-dominant hands. "I feel really grounded in situations where I'm guiding people through a process," Anderson told Seven Days. Drawing with the nondominant hand, she noted, means one is "relieved of [the] expectation of perfection." Basa noted how using her left hand immediately helped her mind slow down. Another participant shared that the task felt "psychologically opening." Jones said the drawing "makes it easy to name the stuff that's on my mind" and likened it to keeping a journal. As the group made the transition from drawing demons on index cards to drawing fairies, Anderson brought out a little tray of bells for participants to ring and "clear the air." There were giggles, murmurs of acknowledgment and plenty of compliments. "I have a frustrated artist inside me," testified IT professional Janice Dawley. "This is a great way to express some of that in a really supportive and friendly environment." Though Anderson's workshops are new, the Bluebird Fairies origin story began more than a decade ago. Now 50, Anderson moved to Vermont in 1989 to work with Bread and Puppet Theater. 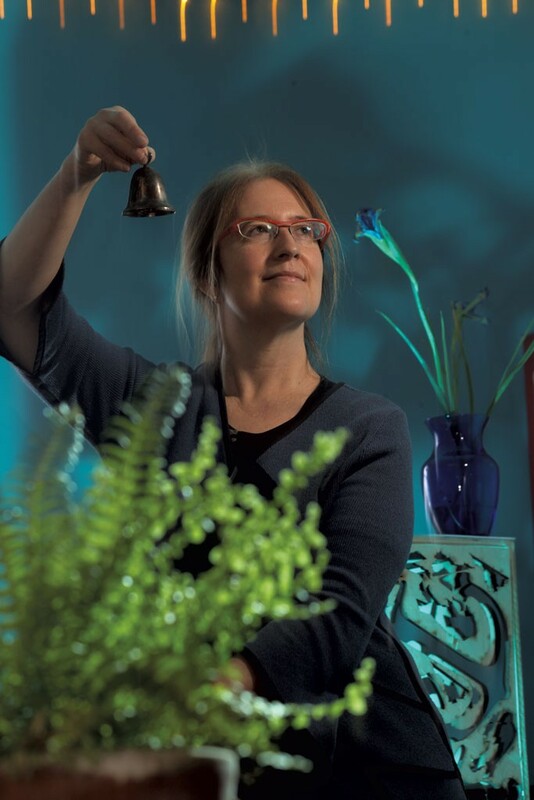 After eight years with the radical theater troupe, first as a company member and then as operations manager, she founded Awareness Theater Company in 1998, which orchestrated performances for people with and without disabilities through VSA Vermont. In addition to being an arts educator, Anderson worked for many years with Mark Utter, a man diagnosed with autism, for whom she assisted facilitated communication. She was instrumental in helping Utter produce his 2013 short film "I Am in Here." Anderson recalled Utter telling her at one point that she didn't seem happy. Indeed, in 2003, she was beset by a confluence of challenges: Her father died, she had a serious car accident, and her relationship was on the rocks. "Something [was] not working in my life," Anderson said. So she began to draw, creating one new demon and fairy every evening. Some of the earliest figures to emerge were the "Glum Goblin," the "Demon of Regret" and "The Grass Is Greener Goblin." When contemplating a move caused anxiety, she drew a fairy proclaiming, "Fear not, dear Emily, I will make sure you are warm and safe." "My whole work had been assisting other people with their stories," Anderson said. "What Bluebird Fairies does is really connect me with [the question] Who am I?" As a 2014 participant in Mercy Connections' Women's Small Business Program, Anderson shared her fairies and demons with her cohort. She gave them readings, using her drawings as oracle cards. "They weren't really into [the idea]," Anderson said. Yet afterward, she recalled, many of the women told her privately how the reading had resonated with them. Realizing she might be onto something, she re-enrolled in the program the following year to firm up a business plan. Anderson named her business for the Charles Bukowski poem "Bluebird." Part of it goes: "there's a bluebird in my heart that / wants to get out / but I'm too tough for him, / I say, / stay down, / do you want to mess / me up?" "Everyone has a bluebird in their heart," Anderson said, "but we want to let them out." Stephanie Salmon of Gotham City Graphics encouraged Anderson to print runs of her fairy cards. Similar in look and feel to other forms of tarot or oracle cards, they're on medium stock with rounded edges, just shy of four by six inches. One side displays simple white line drawings on a black background, including the Bluebird Fairies logo: a stick-figure birdie holding a heart. On the other side, a line-drawn fairy often appears smiling with arms outstretched and encouraging speech-bubble exclamations: "Ah." "Yay!" "Let's go!" Cards in hand, Anderson took up residence at a Lucy van Pelt-esque booth at venues around town, including ArtsRiot's summer Truck Stop, and offered readings for free. But soon she had enough customers to charge — many of them graduating students or young women. Anderson even met her current boyfriend when he drew a "Fairy of the Day" at her booth. "He's totally my fairy prince," she said, smiling. To date, the full Bluebird Fairies deck contains 63 cards, with more on the way. In addition to local appearances and public classes, Anderson offers private workshops and booth bookings for events. A Bluebird Fairies app is underway, and Anderson hopes one day to make the fairies, and their inspirational abilities, available in book format. Last summer, Valerie Woodhouse of Vermont Works for Women invited Anderson to lead a drawing workshop at the Chittenden Regional Correctional Facility as part of the Step Into Work program. The artist returned to the state women's prison earlier this month, drawing the largest number of Step Into Work participants to date, according to Woodhouse. In refocusing her energies on herself and her own story, Anderson appears to have found a uniquely expressive way to provide comfort to others through creativity and a touch of magical thinking. The goal, she said, is to "turn and find the lightness of life — to bring yourself up to a place where you can deal with [challenges] more positively." Update, March 3, 2017: This article has been updated to reflect Janice Dawley's profession. The original print version of this article was headlined "Fairy Godmother"